The Ultima Weapon is the best keyblade in Kingdom Hearts 3, but how do you get it? As we explained in our best Kingdom Hearts 3 keyblades guide, the Ultima Weapon is undoubtedly the best keyblade you can get in the game. The only problem is that you can't get your hands on it until the very end of the game, and when it does become available, it's not easy to unlock. You have to synthesise it, which is essentially the same as crafting, which means you need to find all the correct materials. In this Kingdom Hearts 3 Ultima Weapon guide, we've got everything you need to get the Ultima Weapon and slay Heartless quicker than ever before in Kingdom Hearts 3. 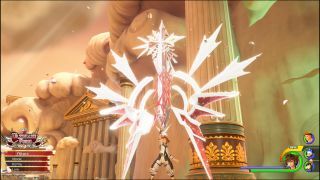 What is the Kingdom Hearts 3 Ultima Weapon? The Ultima Weapon is the final keyblade available to you, and it's required to unlock the aptly named Ultima Weapon trophy/achievement. You have to "synthesise" it, which is Kingdom Hearts 3's way of saying you need to craft it with the right materials. When you do get the Ultima Weapon, it has a Strength and Magic stat of 13 apiece, which is almost higher than any other keyblade in the game - only the Classic Tone keyblade can go higher with 14 Magic at max level. But how do you get the Ultima Weapon? To get the Ultima Weapon in Kingdom Hearts 3, you need to source four separate materials. The first, and easily the toughest, is Orichalcum+. You need seven of the stuff and there's only seven available in the entire game, each found in a specific location or via a certain method. Since it's so tough to find, it deserved an entire guide of its own which you can find here: Kingdom Hearts 3 Orichalcum+ locations. After you've got seven Orichalcum+, you need to obtain two Wellspring Crystals, two Lucid Crystals, and two Pulsing Crystals. Thankfully, they're all obtainable in specific locations endlessly, as long as you've beaten the main story. For Wellspring Crystals, you need to head back to San Fransokyo, the world of Big Hero 6. On top of one of the buildings is Battlegate 12, the same location you obtain Secret Report 12 as explained in our Kingdom Hearts 3 secret reports guide. Keep playing this battlegate over and over and eventually, you'll stack up the Wellspring Crystals. We'd recommend using the Favorite Deputy keyblade so enemies drop more loot. Lucid Crystals are a little trickier. You need to synthesise these yourself at the Moogle shop, and they take one Wellspring Crystal, two Lucid Gems, three Lucid Stones and five Lucid Shards. Farm up enough Wellspring Crystals at Battlegate 12, then head to the Kingdom of Corona. You'll find Lucid Shards by killing plenty of Malachite Boleros, and Lucid Gems are found on Chief Puffs. For Lucid Stones, go to Olympus and kill enough Air Soldiers. If you're unsure on which enemies these are, be sure to consult your Gummiphone Adversaries section. Again, your best bet is to focus on getting the materials to synthesise Pulsing Crystals yourself. It needs one Wellspring Crystal, two Pulsing Gems, three Pulsing Stones and five Pulsing Shards. You know where to get Wellspring Crystals from but for Pulsing Gems, you need to kill plenty of Satyrs. These friendly folks can be found in droves through Battlegate 1 in Olympus, which is just up the stairs from the Realm of the Gods Summit. Pulsing Stones are frequent drops from Powerwild Heartless, which are the small monkeys in The Caribbean. Pulsing Shards on the other hand are most commonly found from Earth Cores in Olympus. When you have all the ingredients you need, head to your nearest Moogle shop and synthesise that Ultima Weapon! When you've got the Ultima Weapon, why not work on finding all of the Kingdom Hearts 3 constellations?